Kroger's upscale Mariano's division is well known for its ample prepared foods lineup. This is part of NRN’s special coverage of the 2018 NRA Show, being held in Chicago, May 19-22. Visit NRN.com for the latest coverage from the show, plus follow us on Twitter and Facebook. Americans eat all day long — grabbing snacks on the go, having food delivered to their homes and workplaces, responding to changing technology and the increased availability of fast, customizable meals with increasing fickleness and growing demand for speed. No wonder foodservice in retail is growing faster than both retail and foodservice. 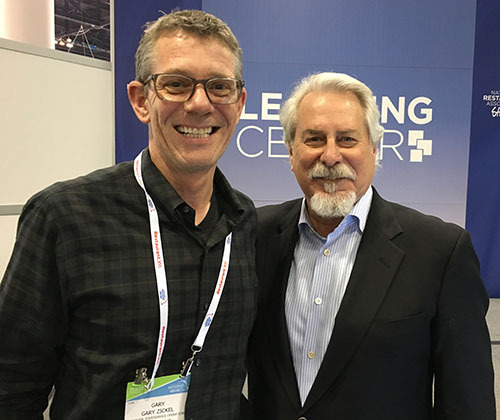 In a discussion during the NRA Show with Gary Zickel, manager of foodservice operations at Mariano’s, supermarket expert Phil Lempert said foodservice in retail was currently growing at around 12 percent to 13 percent annually. But to run those operations successfully, you can’t just promote your deli manager or augment that roast chicken you already offer with macaroni and cheese. While grocers understand center-store dynamics, they don’t necessarily understand how to work with perishable items, and if they do, that knowledge usually stops with produce or maybe the deli, Zickel said. “You can’t expect logistics or receiving people to execute well in the kitchen,” Zickel said. They payoff makes it worth the effort, however, he said, noting that at Mariano’s, a higher percentage of customers get containers from the hot bar than anything else besides pharmacy products. “It’s a draw. It will bring people into the store,” Zickel said. But the dynamics of foodservice in retail continue to change. Mariano’s is phasing out its oyster bars, introduced a couple of years ago, because it can’t find qualified staff. He also said he’s rethinking customizable sandwiches: made-to-order sandwich sales are slowing in favor of grab-and-go ones because they’re faster. However, just having someone available to make sandwiches on request adds to the perceived value of the grab-and-go items — giving customers the sense that those ready-made items were made recently and are therefore fresher. For that reason, he keeps the made-to-order and grab-and-go sandwiches in the same location in each store, so shoppers will associate the two. Even made-to-order items have to be designed to be executed quickly. “We want to speed everything up for the customer,” Zickel said. Consistency is also important, so sauces are manufactured for them, and Zickel makes sure that store directors and co-directors also know what each item is supposed to look like and taste like. With current high turnover rates, “trying to get everyone trained across all stores is nearly impossible,” he said. Another key to successful foodservice in retail is to hand out samples of the prepared foods. The photo caption in this story has been updated with Gary Zickel's correct name.